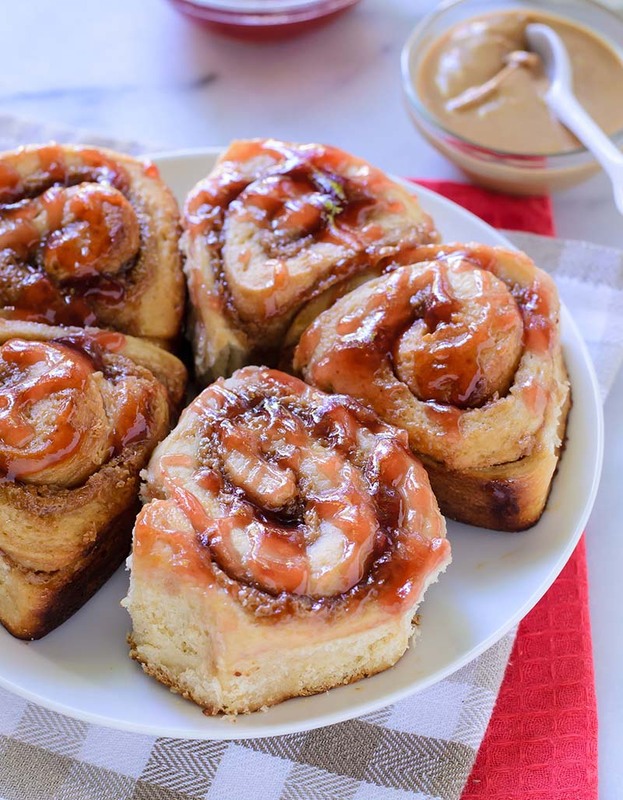 Fluffy cinnamon roll dough swirled with peanut butter and topped with jelly glaze. A sweet breakfast treat with the classic flavor of everyone's favorite PB&J! (1) Prepare the dough: Pour milk into a large glass measuring cup. Add butter and microwave on high, until the mixture is warmed to 120-130°F. The butter may not melt completely and the water should feel warm but not too hot. Once heated, pour into the bowl of standing mixer fitted with paddle attachment or a large mixing bowl. (2) Add white whole wheat flour, granulated sugar, egg, vanilla, yeast, and salt. Beat on low speed for 3 minutes, stopping occasionally to scrape down sides of bowl. Add 2½ cups all-purpose flour. Beat on low speed, until the flour is absorbed and the dough is sticky, scraping down sides of bowl as you go. If dough is extremely sticky, add remaining flour one tablespoon at a time, combining after each, just until dough begins to form a shaggy ball and pulls away from sides of bowl. It should still feel fairly tacky. (3) If using a stand mixer, fit the mixer with a dough hook and knead on medium low for 6 minutes, until smooth and elastic. If kneading by hand, turn the dough out onto a floured work surface and knead until smooth and elastic, about 8 minutes. Add a little flour, one tablespoon at a time, if the dough is too sticky and clings readily to your hands. Lightly oil a large, clean bowl with cooking spray. Form dough into a ball and place it in the bowl, turning once to coat with oil. Cover bowl with plastic wrap or a clean kitchen towel. Let rise in a warm, draft-free place until doubled in volume, about 2 hours. (4) Meanwhile, make the peanut butter filling: In a small bowl, beat together the peanut butter, melted butter, brown sugar, granulated sugar, and cinnamon. Set aside. (5) Form the rolls: Once the dough has doubled, turn it out onto a well-floured work surface. To test if the dough has completed rising, gently press it with your first two fingers; if the indentation remains, the dough is ready.) Roll the dough into a 16-inch x 12-inch rectangle (be sure to measure.) Spread the peanut butter mixture over the dough, leaving a ¼-inch border uncovered on all sides. Spread with jelly, leaving a ¼-inch border of peanut butter uncovered on all sides. (6) Starting at one of the long edges, roll the dough into a tight log, then tightly pinch the end to seal. Turn log so that the seam side is down, then carefully trim each end so that they are straight. (The end scraps can be baked separately in lightly greased ramekins.) Gently stretch and pat the dough log as needed so that it is 18 inches in length and roughly even in diameter. With a serrated knife, gently saw the log into 18, 1-inch segments. (8) Meanwhile, prepare the glaze: Place the jam in a small saucepan over medium low heat, stirring occasionally. Once the jam begins to thin, stir in the lemon juice, sugar, and salt. Heat and stir until the sugar dissolves, then remove from heat. The glaze will thicken as it cools. Bake the rolls: Place rack in the center of your oven and preheat to 375°F. Bake rolls until the tops are golden and the centers reach 185°F to 190°F, 20-25 minutes. Check the rolls at the 15-minute mark—if they begin to brown too quickly, cover the pan with foil and continue baking until complete. Remove from oven and place pan on a cooling rack for 5 minutes. Drizzle with strawberry glaze and enjoy immediately. If you would like to prepare the rolls the night before, once they are shaped and placed in pans (Step 7), instead of allowing the dough to rise a second time, refrigerate overnight. When ready to bake, let covered rolls sit on counter for about ½ hour, and continue with Step 8.